With the ratification of the Adams-Onís Treaty, Spain officially renounced a claim to the Oregon Country on February 22, 1821. The treaty was largely about establishing the border of New Spain and U.S. territory that was part of the Louisiana Purchase. The U.S. got Florida, Spain got Texas (for the time being), and Spain agreed to relinquish any claim to Oregon north of the 42nd parallel – i.e. the northern border of California. 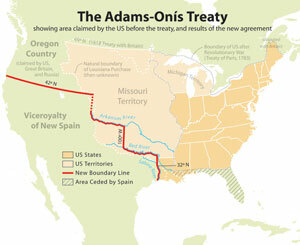 Credit: Adams-Onís Treaty map by Wikipedia user Citynoise. Used under Creative Commons Attribution-Share Alike 2.5 Generic license.